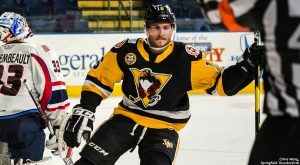 ALLENTOWN, Pa. – The Wilkes-Barre/Scranton Penguins came back in the closing minute of regulation to force overtime and walked away with a 5-4 victory over the Lehigh Valley Phantoms on Saturday at PPL Center. Sam Lafferty buried a hat trick for Wilkes-Barre/Scranton (31-25-7-3), with his third goal coming with 58.4 seconds left in regulation to get the game to the extra session. Ryan Haggerty captured the win for the Penguins on a breakaway in OT, gaining important ground in the playoff race. Lafferty opened the scoring at 10:19 of the first period with a backhand shot that kissed the post on its way to the back of the net. However, Lehigh Valley answered 28 seconds later with Philip Samuelsson depositing a rebound during a delayed penalty, extra attacker situation. The Phantoms taking back-to-back-to-back penalties afforded Wilkes-Barre/Scranton the opportunity to take a 2-1 lead late in the opening frame with Lafferty getting involved in the action again. Lafferty delivered a backhand saucer pass to Joseph Blandisi on the right circle for a one-timer snipe past Alex Lyon at 17:16. Lafferty’s second tally of the night made it a 3-1 edge for the Penguins 9:18 into the second period, but once again, the Phantoms responded in short order. Less than a minute later, Greg Carey pulled Lehigh Valley within one goal of their in-state rival. Cole Bardreau evened the score, 3-3, with 3:45 remaining in the middle frame. The Phantoms took the lead for the first time 6:08 into the third period. Chris Conner took the initial shot high on the right side before Jarry knocked it aside. Byron Froese punched in the rebound to seize the 4-3 command over the Penguins. With the goalie pulled and the extra attacker on, Lafferty earned his fourth point of the night and completed his first career hat trick while procuring the much-needed equalizer. Blandisi’s shot from atop the crease was initially rejected by Lyon, but Lafferty whacked the rebound out of mid-air and tied the game with less than a minute to play in regulation. A defensive-zone turnover by the Phantoms gave Haggerty a clean breakaway in overtime that would ultimately give the Penguins a seismic win and reestablish sole possession of fifth place in the Atlantic Division. Tristan Jarry, who was making his 13th consecutive start for the Pens, factored in 30 saves for the win. Lyon refuted 21 attempts on 26 shots faced. 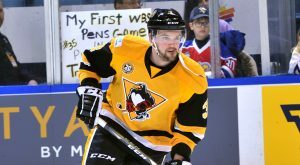 Wilkes-Barre/Scranton’s next game is tomorrow, Sunday, Mar. 24, against the Springfield Thunderbirds. Puck drop between the Penguins and Thunderbirds is scheduled for 3:05 p.m. at Mohegan Sun Arena at Casey Plaza.